From 1986 to 1990, hundreds of volunteer butterfly enthusiasts spent thousands of hours in the field in an effort to record the distribution of Massachusetts butterflies—the first systematic statewide butterfly atlas to be undertaken in North America. Thirty years later and the enthusiasm for butterflies continues. 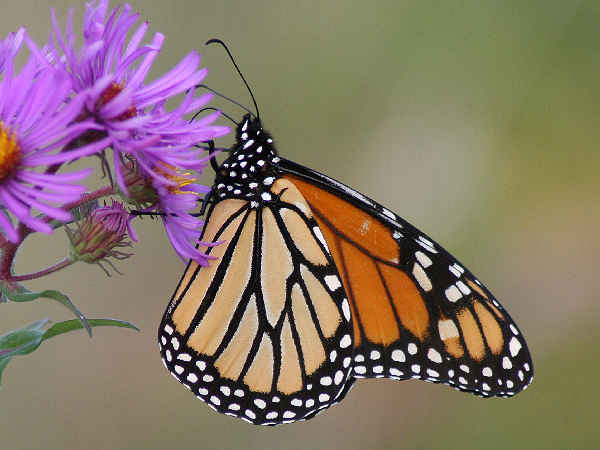 From 1992 to 2010, 19,779 butterfly surveys were made by amateur naturalists in Massachusetts, a geographically small state located at the convergence of northern and southern bioclimatic zones in eastern North America. From these data, we estimated population trends for nearly all butterfly species (100 of 116 species present)..Population trajectories indicate increases of many species near their northern range limits and declines in nearly all species (17 of 21) near their southern range limits. Certain life-history traits, especially overwintering stage, were strongly associated with declines. Our results suggest that a major, climate-induced shift of North American butterflies, characterized by northward expansions of warm-adapted and retreat of cold-adapted species, is underway. One must also conclude that the list of Massachusetts butterflies presented here, along with pictures of representative species, will no doubt change over time. It divides the species according to family, and by extension wing color. A few butterfly pictures are included. Visitors interested in additional butterfly pictures and identification help can press the green butterfly button. Comparatively speaking, Massachusetts has a lower than average number of butterfly species in the family Pieridae. They are rather evenly split between the butterflies with white wings and yellow wings. The picture shows a Little Yellow butterfly. Consider yourself fortunate to see one. It’s rare in the state. 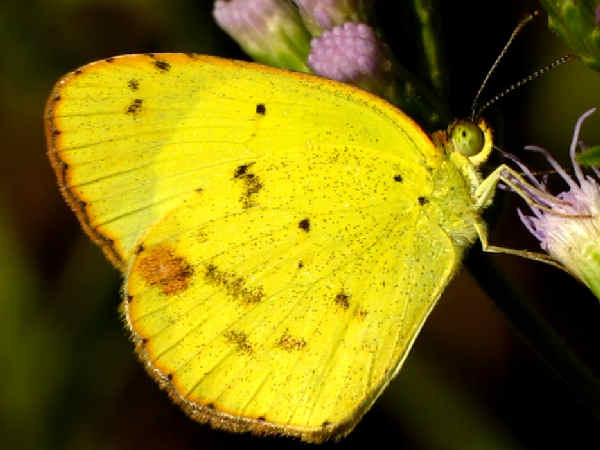 The other Sulphur buterflies are fairly widespread. White butterflies are hard to come by in the state. During the recent surveys no Falcate Orangetips or Checkered Whites were found. Residents in the west have an opportunity to see the West Virginia White and Mustard White. 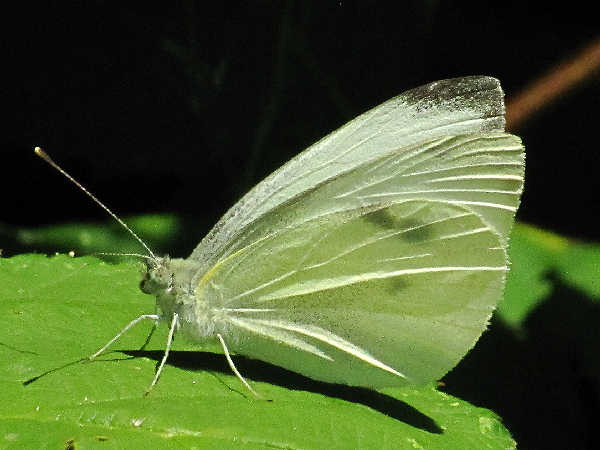 Otherwise, the Cabbage White, the famous back yard garden butterfly represents the white butterflies for the state. It is very common. Many of Massachusetts gossamer wing butterflies have a nation wide distribution. 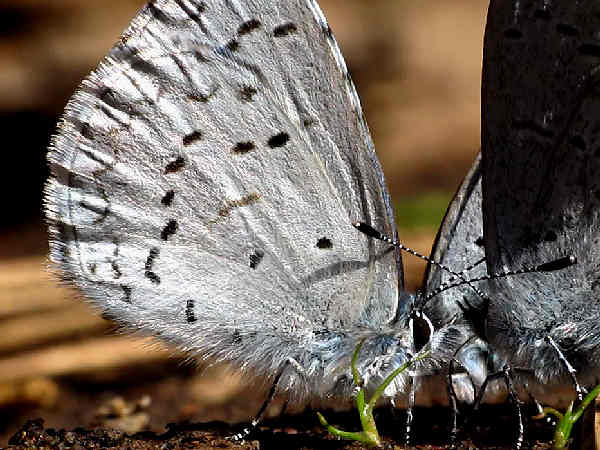 In the blue buterfly category, consider the Azures. Azures can be identified by light-blue upperwings. Females have wide dark edges around the forewings. From a side view picture, the underwings show a white background, coupled with a variable number of small black spots and chevron marks along the top of the wings. Basically there are spring and summer varieties, depending on when they appear. 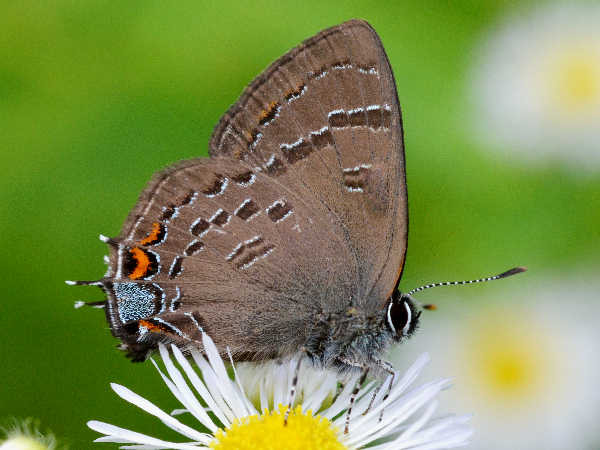 The twenty hairstreak butterflies are also common Eastern species. Of the six Elfins, the small brown butterflies, the Brown Elfin and the Eastern Pine Elfin have a statewide distribution. The picture shows a Banded Hairstreak. It has a state wide distribution. With monarchs, queens, viceroys and emperors, Massachusetts almost covers the royalty butterflies. Add in the admirals and now the royalty have nominal protection. All of these species are common to residential areas and gardens around the state. 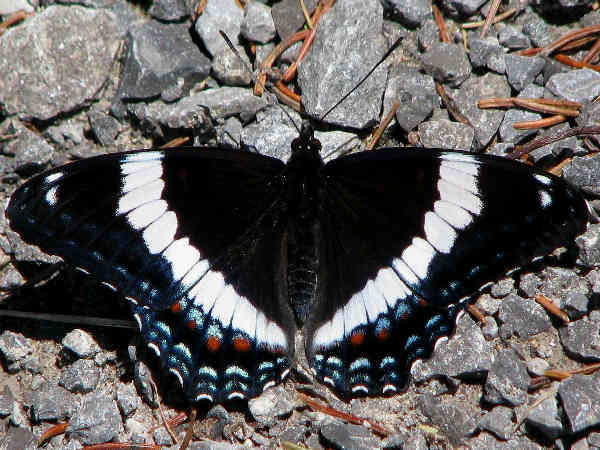 The White Admiral in the picture is easily identified by the large white stripes along the top of the wings. They too are common across the state. 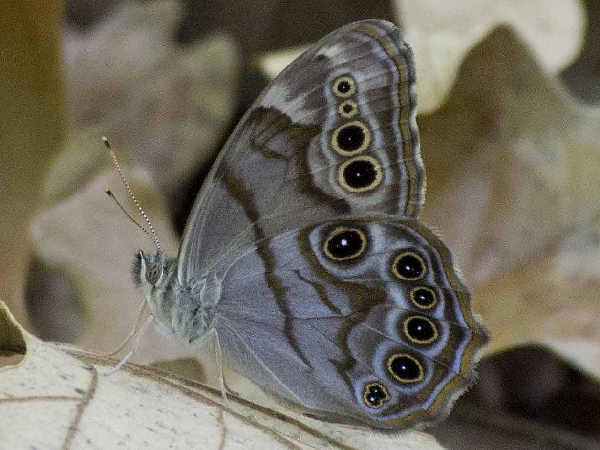 A dull brown wing color means that the Satyrs and Wood Nymphs often don’t get the same amount of attention as the more colorful brush footed species. Giant Swallowtails and Zebra Swallowtails are rare visitors to the state. 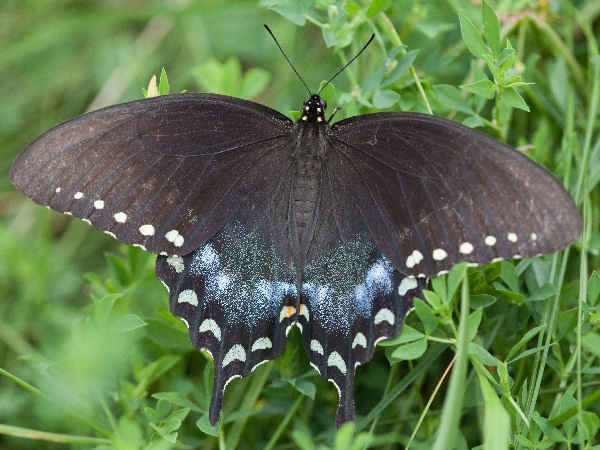 The Spicebush Swallowtail is one of four native butterfly species with dark wings. The picture shows that the top of the wings are primarily dark with a line of sight spots running down the sides. The abdomen also has light spots on it.